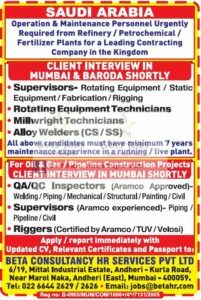 Walk In Interview In Baroda: SAUDI ARABIA operation & Maintenance Personnel Urgently Required from Refinery Petrochemical Fertilizer Plants for a Leading Contracting Company in the Kingdom CLIENT INTERVIEW IN MUMBAI & BARODA SHORTLY. I am imran khan i m a diploma mechanical engineer and and I have three year experience in oil plant I want to work in Gulf if there is any matching job openings so please inform me. i passed diploma civil from 2005 and still pursuing Degree engineering in last year. Yet my Degree completion than i will interested for subjected jobs. Still i have in AJMERA GROUP IN AHMEDABAD HIGH RISE BUILDING PROJECT,I HAVE TO MANAGE ALL THE QUALITY CONTROL DIVISION. 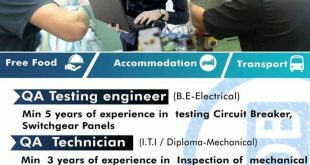 I have 4year of experience in hvac and firefighting,please help me to gulf job. i am looking for safety officer job. i am fresher in this line. I am B.E. mechanical engineer looking for career change. Total experience 11 years in ship construction and design. Seeking golden opportunity at gulf. 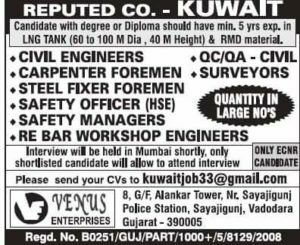 I am safety officer and we are looking for gulf recruitment. I have degree in mechanical engineering and 4 year experience as mechanical project engineer. Power project , chemicals or petrochemical project etc. Have you vacancy for me . Tell me. i have 5 year experience in SCADA/ CONTROL ROOM OPERATOR/ TANK FARM OPERATION. Sir I am looking for safety officer job.i am msc environment and doing post diploma in industrial safety..looking for gulf job.i have 2 years experience in ehs dept. Sir Iam trined safty management course.